Savasana/Corpse Pose – Lay on your back, hands open facing up, and next to your hips or outstretched, depending on what is most comfortable to you. One of the key poses of yoga is Savasana (corpse pose). This is simply lying on your back, hands out next to your hips facing up. Focus on taking slow deep inhales and exhales. In your mind’s eye scan your body, sensing if you have any stiff or aching muscles, joints, or bones. Another key pose, Viparita, Karani (legs up the wall), helps to rejuvenate and restore the energy in the body and mind. Sitting sideways against a wall, pivot the body so the legs are straight/parallel up against the wall, while laying the back on the floor. Lengthen the spine. Pelvis tilts into the floor. You should manipulate your body so you are comfortable. Loosen the jaw and face muscles, then begin to point and flex the feet. Be conscious of your breathing, taking slow deep inhales and exhales. Begin to do circles with your feet, loosening the ankle muscles. Viparita, Karani – This pose is more comfortable up against a wall, but if you live in a small space with no open walls, doing it without the wall also helps overcome fatigue. Then take one of your feet into your hands massaging it with your hands, then switch and do the same with your other foot. Then feet back against the wall, stretch your arms out above your head along the floor, inhale and exhale slow and deeply. Coming out of the pose twist to one side (whichever is most comfortable to you) both knees together and bent. Take your time getting up, hands under shoulders push up, knees bent, sit up onto your heels, breath, then stand when ready. Do not do this for more than twenty minutes. 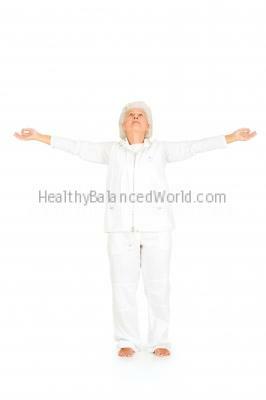 This pose can be the only pose you do every day, as it is really good for overcoming fatigue. You may want to put a rolled up towel under your neck/skull if you are stiff in the shoulder/chest area. Always remember, breath and posture while doing these yoga poses not only help one to relax and get through menopause symptoms easier, but also helps one get more in touch with who they are.